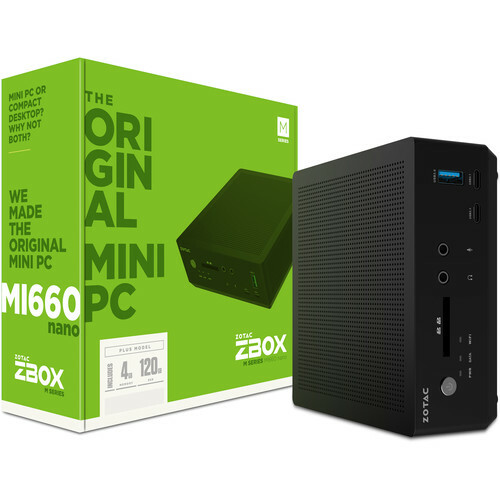 The ZOTAC ZBOX MI660 nano PLUS Mini Desktop Computer features a compact design to save you space on your desktop. The compact design allows you to use the included VESA mount to place the computer on the back of a monitor. With available HDMI 2.0 and DisplayPort 1.2 outputs, the ZBOX nano Plus is dual-display ready. The integrated Intel UHD Graphics 620 brings 4K @ 60 Hz display resolutions. The system is powered by an 8th-Gen Kaby Lake R 1.8 GHz Intel Core i7-8550U quad-core processor. It also has 4GB of DDR4 RAM, a 120GB 2.5" SATA SSD, an SDXC media card reader, dual Gigabit Ethernet LAN ports, Wi-Fi 5 (802.11ac), Bluetooth 4.2, USB 3.1 Gen 2 Type-C, USB 3.1 Gen 1 Type-A, a 3.5mm headphone jack, and a 3.5mm microphone jack. Windows 10 Home (64-bit) is the installed operating system. The ZBOX MI660 nano Plus houses an 8th Gen Kaby Lake R Intel Core i7-8550U processor. Its dual cores have a base speed of 1.8 GHz. The processor can also be boosted to 4.0 GHz when needed. This computer comes with an included VESA mount so you can mount it behind a monitor to save desktop space.